Pure Hemp Botanicals provides a broad array of very interesting and innovative products. All of these products consist of organic ingredients and the tea specifically is completely pure hemp with no additional ingredients. All of these products do, in my opinion, attain to a very fine standard of integrity and quality. 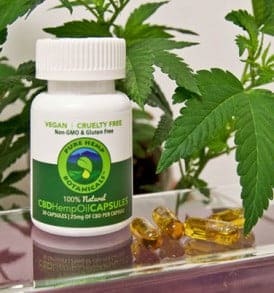 The CBD capsules contain only hemp oil and organic refined coconut oil. The vape pen oil contains only hemp oil and d-limonene (a constituent of citrus rind, i.e., orange, lemon, etc.). The d-limonene is likely intended to be a flavoring agent and possibly to decrease the viscosity for better operation in the vape pen device. While I appreciate the minimalistic approach to the vape oil’s ingredient list, I would like to see if a hemp oil only product could be made to function well in a standard 510 style vape pen. However, this may not be easily accomplished due to the viscous nature of the raw material and I must say that the Pure Hemp Botanicals’ vape oil is by far the best of its kind on the market that I have had the pleasure of using. -All products are completely organic and very effective. It is hard to say whether or not the muscle rub is effective due to the hemp oil or due to the standard mix of camphor, menthol, etc. in the muscle rub; but the tea, vape oil, and capsules are all quite effective and well worth the money. -The tea is a very pleasant tasting tea with a mild flavor. I prefer unsweetened plain tea, so this tea alone is quite nice to my tastes. The vape oil also has a very pleasant natural citrus flavor that is quite enjoyable. 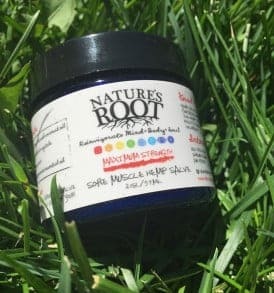 The muscle rub has a very pleasant mint aroma that does not have the overly chemical scent that is so common to over the counter muscle rubs. -The capsules are very convenient; as are the vape oil pens. 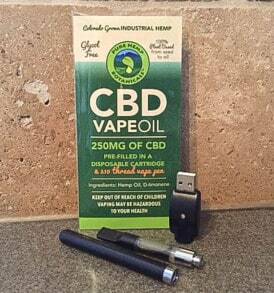 In fact, the vape oil pen is the most convenient way to vaporize hemp oil that I have used thus far (not counting CBD “vape liquids” that contain glycerin and/or propylene glycol as they are nowhere near the same caliber as true hemp oil supplements). The tea is a standard tea bag type package and comes with all of the standard conveniences that all tea drinkers are accustomed to. The muscle rub comes in 2 packages. An oversized “chapstick” style tube with a turn dial at the bottom to extend the product upwards to expose more of the product. The second package is a tub. The tube package is far more convenient and allows you to apply without using your hands. The tub requires you to apply with your fingers just as a Vaseline tub does. All products are designed well and the customer was definitely a major focus in the design application of these products. 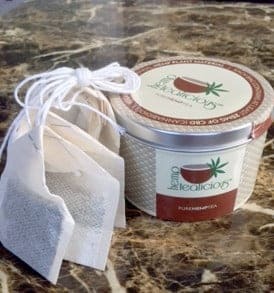 Kudos to Pure Hemp Botanicals! -Capsules taken orally, vape oil vaporized in provided vape pen, muscle rub applied topically, tea ingested orally. Attempted the tea in the Magic Flight Launch Box dry herb chamber; and while it was effective, it did taste MUCH better as a beverage than in vapor form. -1 tea bag in one cup of tea poured and infused following the directions on the container. This was a mild and enjoyably effective method of using CBD. Subsequent cups were doubled up. That is to say, I would make one cup of tea with one tea bag as per the instructions; but once that cup was finished I would again pour a full cup of heated water back into the cup over the same once used tea bag for an additional follow up cup immediately after the first. I found this to be very calming and quite enjoyable; but not too strong. I very much recommend this product. -1-2 small pulls from the vape pen have been used numerous times. The effects from this have been actually quite a bit too strong on several occasions. I’m still trying to get the amount down to a reasonable dose consistently so I am not too effected; and as such do not use this during the day or even frequently yet for obvious reasons. I also find myself experiencing acid reflux type symptoms when using this vape pen. I am prone to this issue so I’m not sure if it is because of the strength of the product or the inclusion of the d-limonene, which oddly enough can be used to treat acid reflux when taken orally. Either way, this is a good product, I just haven’t gotten the usage of it down properly yet so as to not end up accidentally overdoing it. It is a VERY fine line! -The muscle rub has been used many times in many different areas for varying aches and pains. It has been effective at treating all with the exception of intense head and neck pain I experience as a result of a major injury many years ago. Sometimes nothing helps that pain so it is not the fault of the product. -The capsule dose is 1 capsule. Seeing as how strong the vape oil is I only ever took 1 at a time. The effects were noticeable; but for my particular application these were not my preferred method of administration. Their convenience and minimalist ingredient list, however, make them a wonderful candidate for your medicine cabinet. I could see them being a first choice for inflammation and other pains. -Pure Hemp Botanicals’ commitment to organic products and a minimalist ingredient list instills confidence in me and causes me to be willing to trust their products. However, they do not provide any independent or internal laboratory testing to confirm the quality and purity of their products or source material. They do provide information explaining that the hemp they use is grown organically, and hence without the use of pesticides, and locally in Colorado where they are based. I would like to see credible laboratory testing of their products or the source material at the very least to really be satisfied. Would you buy it again? Why/why not? I would definitely purchase products from Pure Hemp Botanicals again. They are clearly designed with the consumer in mind, are very effective, and do not contain unnatural or potentially harmful substances. Also, they are very reasonably priced in my opinion. I am a science, art, and technology enthusiast with a passion for research & helping people increase their quality of life by removing toxins from both their diets and their medicine cabinets. 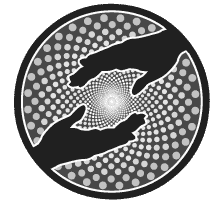 Stacy Anderson on Is CBD Oil Addictive? Linda Bishop on What is the Difference Between THC and CBD?